Cutler struggled throughout his years in the White House to discover and embrace his own sexual identity and orientation, and he was in love with a man half his age, NSC staffer Skip Koons. Cutler poured his emotions into a six-volume diary and dozens of letters that have been hidden from history. Steve Benedict, who was White House security officer, Cutlers' friend and Koons' friend and former lover, preserved Cutler's papers. All three men served Eisenhower at a time when anyone suspected of "sexual perversion", i.e. homosexuality, was banned from federal employment and vulnerable to security sweeps by the FBI. Peter Shinkle worked for 19 years as a reporter at various news organizations, including most recently the St. Louis Post-Dispatch. He covered the federal court system, and also wrote investigative stories on subjects ranging from improper disposal of radioactive waste to contamination spread by a lead mining company. Shinkle is the great-nephew of Robert Cutler. It was during a family vacation in 2006 that his mother, Judith Cutler Shinkle, and his aunt told him that their "Uncle Bobby" was gay. 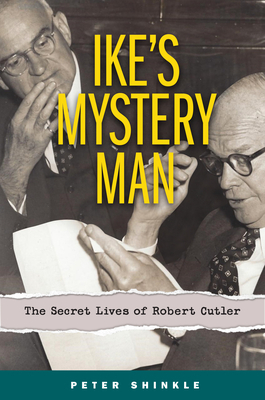 That sparked a 12-year endeavor to explore the story of the man who was one of President Eisenhower's closest advisors.